Travel by camper or tent? 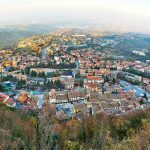 In San Marino you can find 5 camper areas and a holiday center with bungalows and tents for an adventurous vacation on Titan. Camper place, load potable water and sump. Next to to the car park of the Olympic stadium. Camper place, load potable water, sump and toilet. Pedestrian access to the cableway Borgo Maggiore-San Marino. Camper place, load potable water, sump and toilet. Camper place, load potable water, sump. Stop allowed in the near car parks. Route Campo dei Giudei, near study centre. Holiday village including residential units (wooden bungalows and small apartments in masonry) with amenities and a campsite (100,000 square meters with 200 camping sites) open all year. 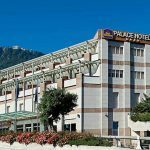 Situated in a quiet area, close to the historical center of San Marino.